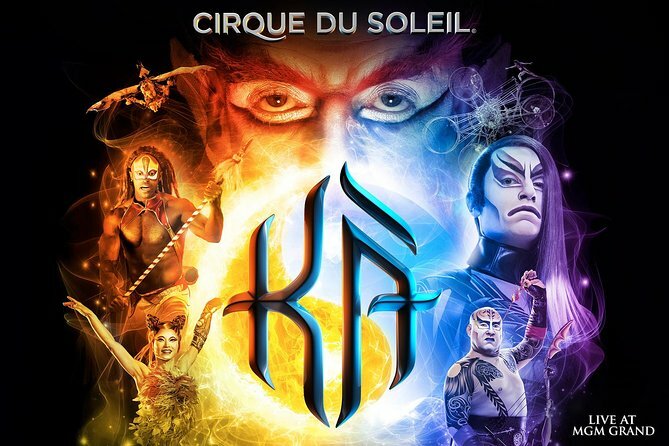 KA by Cirque Du Soleil is an amazing gravity-defying production that tells the heroic tale of twins on a perilous journey to fulfill their shared destiny. The title of the show, KÀ, is inspired by the ancient Egyptian belief in the "KÀ", an invisible spiritual duplicate of the body that accompanies every human being throughout this life and into the next. 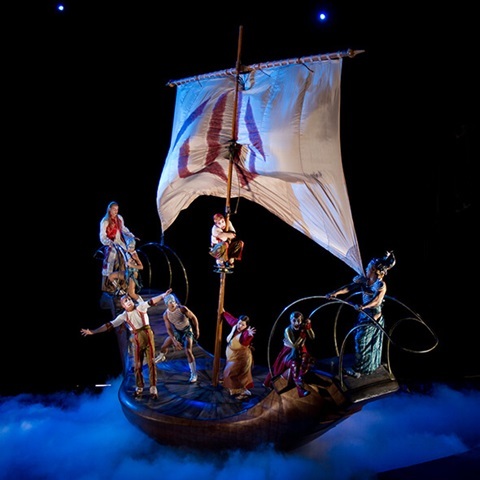 The KÀ storyline is more straightforward when compared to other Cirque du Soleil productions. The story begins with twins that share a destiny, and circumstances that dictate they must embark on a, separate, perilous journey. Along the way, the twins are hunted by Archers and Spearmen, and encounter dangerous and mysterious obstacles at every turn. A battle takes place on an enormous rotating horizontal and vertical stage that transforms the characters’ world at the culmination of the Twins’ journey. The Storm, which takes place on a specially designed boat that weighs 1800 pounds. 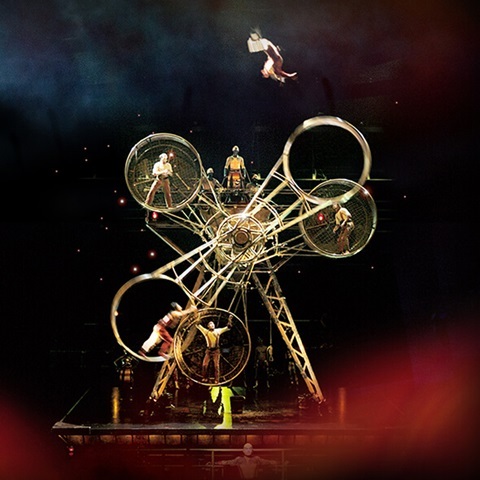 The rocking and turning movements are completely manipulated by the performers on board. Slave Cage, featuring the Wheel of Death (part terrifying machine, part prison), powered by slaves running in hamster-wheel cages on both ends of a long rotating pendulum arm. A new type of digital screen printing was utilized in order to design many of the costumes. Examples include the Forest People, Archers, and the Counselor's Son. The Forest People's costumes rely on printing the performers' body definitions onto the actual fabric. This enhances the appearance of their skin looking like it is actually blue and green. An off-stage band accompanies the acting, acrobatics, and singing that take place during the show. During some scenes, different musicians make appearances in the show, performing in costume on the stage. The soundtrack for Kà was released in October, 2005. In addition to the original score, the soundtrack features several 'inspired by' tracks. ...ONE OF THE MOST AWE-INSPIRING AND TECHNICALLY ADVANCED STAGES EVER CREATED. DANCE, ACROBATICS AND PERFORMANCE ART, PYROTECHNICS, AERIAL DISPLAYS, AND BREATHTAKING STUNT WORK. EDGE SAN FRANCISCO. Children under the age of 5 are not permitted into the KÀ Theatre. Guests under the age of 16 must be accompanied by an adult. Unlike other Cirque du Soleil performances, Kà offers four pre-shows starting when the theater opens. Ticket prices start at about $69 for standard seating and prices go up from there. No V.I.P. experience is available. Ticket Starting Price (Full Price) – Approximately $69 for standard seating. * KÀ lacks a conventional stage with a permanent floor; instead, two giant moving platforms and five smaller lifts and platforms appear to float through a bottomless space. * The KÀ theater is equipped with a pair of speakers at ear level in every seat and hundreds more strategically placed around the auditorium. * The infrared video motion detection as well as a system of touch-sensitive panels beneath the surface of the main 'Sand Cliff' deck allows the system to track the location of individual performers and change the video content accordingly. * It took approximately 1,300 hours to create the crab puppets in the beach scene.